It's not a surprise for anyone that Google celebrates April Fools' Day. Since 2008, Google's offices outside of US have their own pranks. "For this animal, the dog still, cats, pigeons are just the future, cows and horses, hamsters, frogs, and plans to expand into. Voice Search a variety of potential animal, you try all means, exchange'd appreciate help with animals. Google's mission is to organize the world's information and make it universally accessible and useful to the people around the world. You are also feeling the animal to be able to access, will continue to continue research, and Nakajima are saying." There's also Google Translate for Animals, a new Android application that "allows you to record animals sounds and have the sounds analyzed and translated by Google Translate into any of the 52 supported languages". Google Australia is now able to "Optimise for Colloquial Cultural Articulation (OCCA) - which means our products can now be tailored specifically for the typical Strayan user. (...) OCCA greatly reduces the latency between a user's thought and ability to pinpoint information; a boon for local users who'd have Buckleys makin' sense of American English." Google decided to change its name to Topeka, the US city that intends to change its name to Google. Google's search results pages use some interesting units of measurements to estimate how long it took Google to obtain the results: Plunk, gigawatts, warp, centibeats, skidoo, femtogalactic years, velocity of an unladen swallow. YouTube has a new text-only mode: TEXTp. "It's great news that there are 24 hours of video uploaded to YouTube every minute, we support 1080p and HD uploads are rising quickly, but that's also meant increasing bandwidth costs cutting into our bottom line. (...) TEXTp is the result of months of intense transcoding efforts by our engineers, who toiled for weeks to ensure that a large chunk of videos on the platform could be reduced to their most basic elements. By replacing the images in the video with a series of letters and numbers, the videos are far less taxing on our system -- and have the added benefit of promoting literacy!" You can try the new mode by appending &textp=fool to YouTube URLs (like this). Google Docs lets you store ANYTHING. "Ever wish you could CTRL+F your keys? Store your keys and other objects you commonly lose with Google and you'll never have to worry about finding them again. We're testing a new mail courier network integrated with our Street View fleet. We'll show up within 3 hours to pick up anything you choose to store in Google Docs, guaranteed. At $0.10 per kg, you can store a grand piano for the price of lunch." Google Voice added a standard voicemail mode. 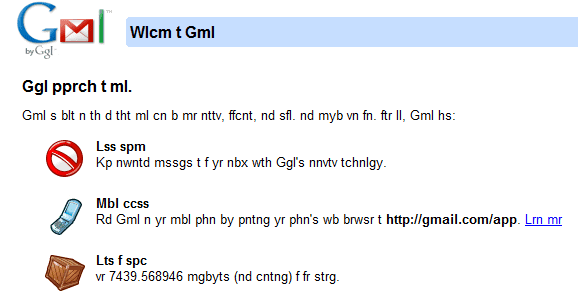 Gmail's login page no longer uses vowels and greets users with a short message: "Wlcm t Gml". 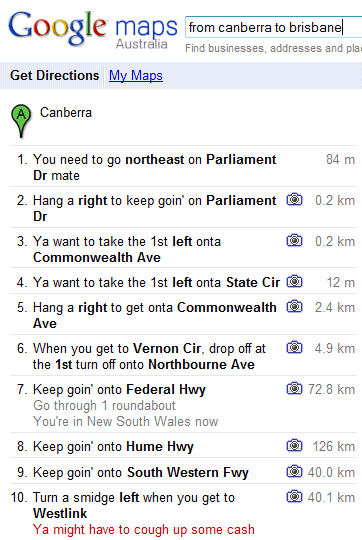 Yes, it's real and it's from Google Maps. It's similar to last year's special Chrome build. Google even posted instructions for creating 3D glasses. 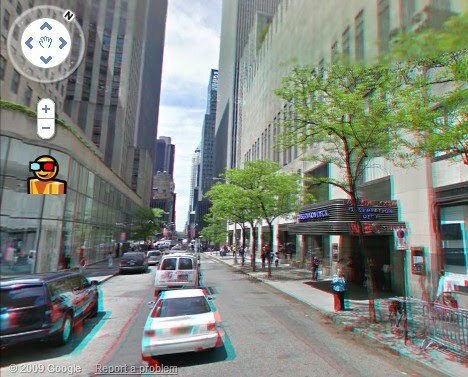 I've picked a random Street View image from maps.google.com, so there's no special URL. Is google using dolphin web browser in the video ?! Saw it too. I've got a pair of those glasses for that, and it actually looks better with this. 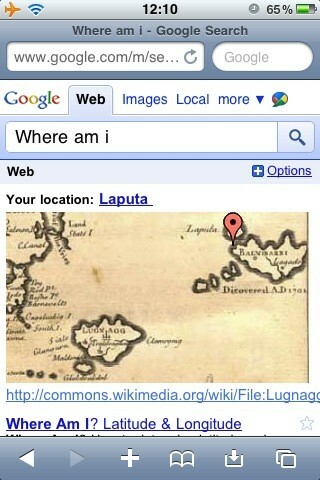 But well, as long it's just a frozen image it's nothing special to use..
Topeka is the new Google name?? April Fool!!! But they did have me for a second!! "Featured notifiers: Ashton Kutcher; Dr. Wave; Grandma; Werner Heisenberg; Puppy. Please note that some notifiers are not available at all times." top city? they know that? i feel like a special lil topekan! How stupid. I hope that they didn't change their name to Topeka. That would be dumb. Awesome April Fool's Day prank! You are geniuses! You couldn't have chosen a better town. It's as midwest America as you can get. Awesome, my favorite one is the Animal Translate. We all celebrate April fool day, Most of the user love Google for all these reason, Google always updates itself according to the festivals and celebration, very happy to hear the news. great beauty captures me' but a beauty still greater frees me even from itself. I fell for the name change, hook, line and sinker. I thought Google had lost its mind changing the company name like that. Didn't even notice the other pranks. Well done Google! Few minutes of healthy and refreshing laugh. Thank you, g-guys! haha..tht was brilliant. i found out until the next day. I fell for this one hook line and sinker and even did a blog post on it.